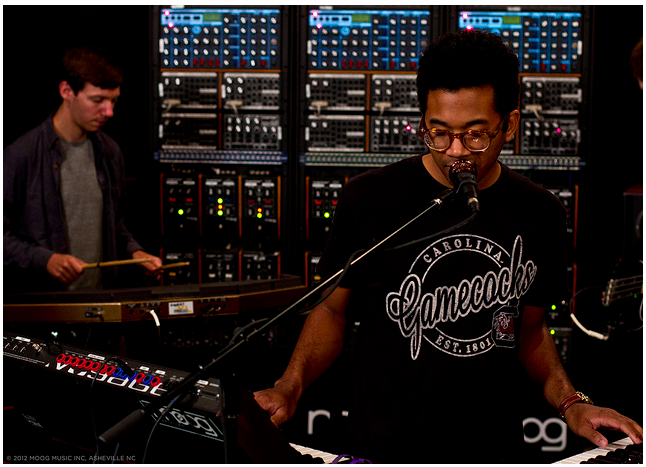 Toro Y Moi recently stopped the Moog Music factory in Asheville, North Carolina to performed his song, “So Many Details” as a part of the Moog Sound Lab performance series. The series features artists performing a different take on their songs using primarily Moog based gear. Moog Synthesizer’s are notoriously known throughout the music community as pioneering many of the famous keyboard sounds you hear in popular music today. It appears as though Toro Y Moi is one of the first artists to be featured on the new season of Moog Sound Lab sessions. With past performances from acts such as Ra Ra Riot, Phantogram, and The Antlers, we should expect to see more exclusives from other notable artists in the future. You can view Toro Y Moi’s performance of “So Many Details” below. Toro Y Moi’s newest album, Anything in Return is out now on Carpark Records. You can also catch him performing at SXSW this year. For more info and a list of past performers on the Moog Sound Lab series, visit their official website here.